The latest homemade fruitcake tasting took placeon the 28th, and many delicious cakes were enjoyed!! This evening was a homemade only event--no commercial bakeries were included. Notice that quite a few of these are duplicates from last year's tasting. I guess they were good ones! They were all winners in this bunch. Two of the guests made Alton Brown's Free Range Fruitcake, so we did a head-to-head tasting of it--and found them both to be yummy. There were slight variations between the two: one baker had soaked the cake in brandy, while the other had lightly spritzed same, and we found that the latter had a bit lighter taste because of it. So for anyone making their own, take note--adding alcohol gives the cake a heavier character. If you don't like candied fruit, this is a good recipe for you--all dried fruits. It almost looks like a quick bread, and we agreed that a generous dollop of cream cheese and this would be a delicious breakfast bread. Perhaps for Christmas morning? Both the Best Fruitcake Ever and Fiona Cairns' fruitcakes are stellar--full of a variety of fresh and interesting flavors, rich and delicious, and the almond extract-flavored glaze adds an extra little pop. Now, for that asterisk above on the Dark Fruitcake: I learned while searching for the Joy of Cooking Dark Fruitcake recipe on the internet, that the recipe in my edition of the Joy of Cooking was misprinted. It was actually missing about 6 eggs! There was also too much brandy in the recipe (but can there ever be too much brandy in a recipe, I ask you). We all did remark on my cake being sunken in the middle. I attributed that to (and still attribute it to) the fact that I mistakenly baked it in 2 stacked loaf pans instead of 1, so it was more insulated than it should have been. Regardless, it was a good fruitcake. Everyone liked it for it's markedly dark flavor, attributable to the molasses and brown sugar in the recipe. I actually found it to be a bit too dark for my taste, edging into burnt tasting (to me). Could also be the large amount of raisins in the recipe. Eat lightly. Our hostess ordered 2 big pizzas (from Roots--delicious!) for six people, which on an ordinary night could have easily been decimated, but people limited themselves to only a few slices, knowing that the tasting lay ahead. Pace yourself. We enjoyed conversation for a while after dinner, ate the first round of fruitcakes, talked a bit more, than went back in for round two. This approach allowed us to clear our palates and heads so we could fully enjoy all the cakes. Small slices! Notice the sizes of the slices we had cut above. 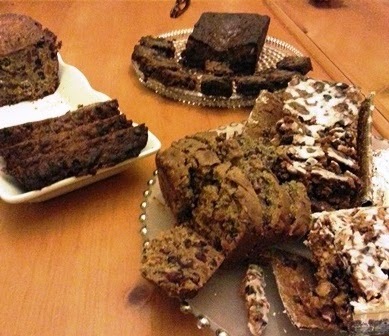 The Free Range Fruitcake slices at top left were further cut into thirds for tasting. This is heavy stuff, and can only be fully appreciated and enjoyed when doled out in small pieces. Anything bigger and you're groaning in pain by the end of them all and might dream of fruitcake slices chasing you--which is what happened at previous tastings. I'll post the stollen recipe soon!